First, it was at his older brother’s birthday party. I trailed after them and saw him point out the bathroom, then wait in his assigned spot. When I approached to join him, he put out his hand like a stop sign. Huh. I guess he told me. Someone wants to be a big boy. My second “schooling” by my toddler was this weekend. I was mopping the tile floor and warned my youngest to stay off until it was dry. He argued that it was safe because he had bare feet, not socks. I explained it was still slippery with bare feet, but he wouldn’t take my word for it. Sure enough, he slipped and landed on his bottom. Now I didn’t come right out and say ‘I told you so,’ but I may as well have. Are you okay? That’s why I wanted you to stay off, honey. Did you hurt anything? Yes, my bottom, he said. Okay, it may sting a little now, but it’ll go away quickly. I went back to finish mopping. That’s when the water works started. Yes, I know, honey, but there’s nothing I can do to make it better. And the very second the words were out, I thought, Well, how stupid am I. And that’s when my 3-year old pointed out the obvious. Mama…just…just give me a hug or something. I propped my mop against the wall and immediately hauled him up in my arms. I nuzzled his neck with kisses and hugged him close. The water works immediately stopped and he went off to play. Jeez, just last week I vowed to fill this house with more hugs, and here I almost missed just such an opportunity. In these two instances, my son reminded me that he struggles between being a big boy and still being my baby. One minute he wants to be twice his age and the next he’s needing reassurance. Sometimes they can’t make up their minds. But that’s okay, because neither can we. I wish they’d grow up. I don’t want them to grow up. I wish they’d grow up. I don’t want them to grow up. When my youngest crawls in my lap and begins to play with the ends of my hair, I can’t help but wish he would stay this small, cuddly being that makes me feel cherished with a simple hair twirl. Yet, when he throws a toddler fit about putting on his own shoes, I roll my eyes. When my oldest lays his head on my shoulder while reading stories at night, I know one day he’ll no longer ask me to read with him, and I’ll miss it terribly. Yet, he drives me crazy when he thinks he knows more than I do about…everything. When they want to grow up too quickly, we want it to slow down. Other times we forget that they’re still so young. Here’s all we really need to remember. 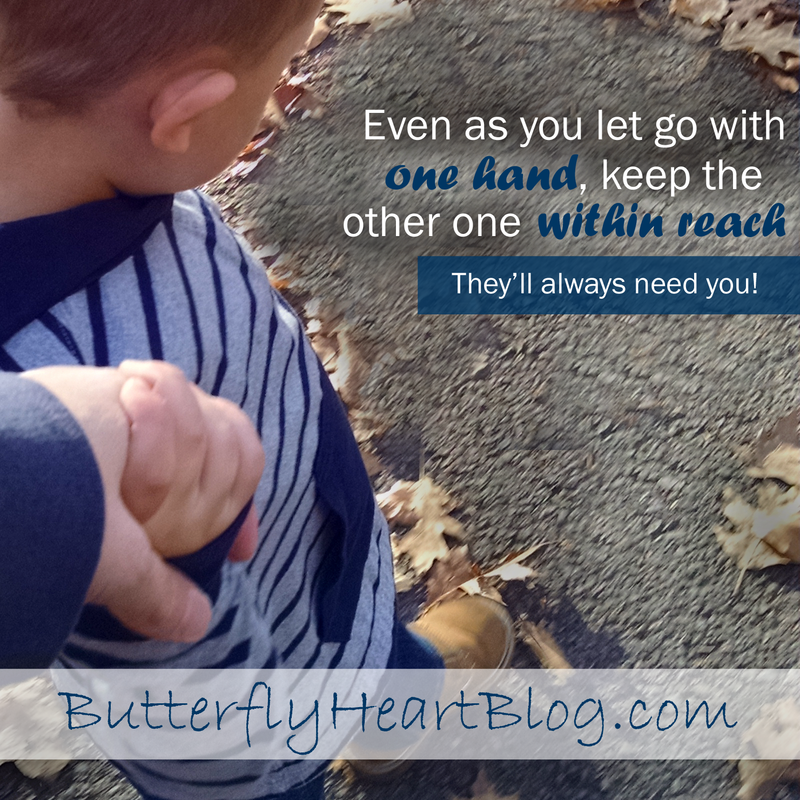 Even as you let go with one hand, always keep the other one within reach. What my 3-year old reminded me was to keep my eyes and ears open. Not only for when he still needs me, but also when he thinks he doesn’t. At those times, I will be there anyway. And there will probably be times he should be given more freedom, but I’ll still want to feel needed. It’s a give and take. One where I’ll always be ready to give. Dear God, grant me the wisdom to know when to let go and when to hold on. When to keep my tongue and when to share my stories. When to lift them from a fall and when to wait as they pick themselves up. Help them grow to be confident, loving, compassionate, independent, and faithful. And as I grow older…even as their manly hands engulf my small, wrinkled ones…please never, ever let my failing mind rob me of the precious memory of their little hands in mine. It’s a feeling I want to hold on to forever.